When you think of Marbella, images of the “Golden Mile” and its extravagant collection of celebrity-filled clubs, shiny restaurants and chic hotels spring to mind. 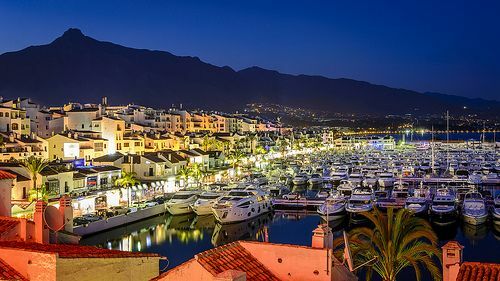 Add to this a swanky marina in Puerto Banus full of mega-yachts and supercars and you have a ready-made playground for the rich and famous. 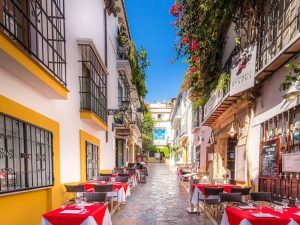 Marbella, however, is a bit like a two-sided coin, as once you get past the ostentatious veneer you notice a traditional Spanish town complete with whitewashed houses and well-tended flower boxes. Located in a magnificent natural setting with the Sierra Blanca Mountains as a backdrop it’s easy to see why this part of the Mediterranean has been home to the Phoenicians, Visigoths, Romans and Moors. Blessed with 27 km of sandy Mediterranean beaches and over 300 days of sunshine per year, Marbella is not just for the jet-set, but for regular everyday people looking for that perfect Spanish holiday. Below we have made a list of what we think are the best things to see and do while visiting Marbella. The best way to get around Marbella is by foot with walking allowing you to soak in the atmosphere at an unhurried pace. Taxis are also readily available and have ranks located throughout town. Tour operators offer day trips to the region’s main attractions and will pick you up from your hotel or a designated meeting point. Other options for getting around include hiring a car or taking advantage of local buses that serve Marbella and the surrounding towns and villages. Located a stone’s throw away from the away from the seafront is the Casco Antiguo (Old Town) district of Marbella. A place that will have you conjuring up memories of what life must have been like before tourists discovered the Costa del Sol back in the 50’s. Set between a labyrinth of richly decorated houses your senses will come alive as you discover the Plaza de los Naranjos (Orange Square). Built around a Renaissance fountain surrounded by orange trees, the square is looked upon as the hub of the city where everyone comes for their morning coffee or as a starting point for a night on the town. 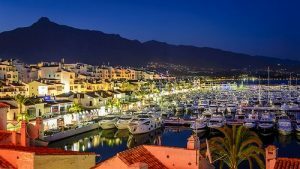 Puerto Banus by night – a must see! No matter what else you want to do while in Marbella, you must visit the marina in Puerto Banus. It is here you will experience a vibe similar to that of St Tropez, where people watching almost becomes akin a sport. A walk around the harbour will give you a glimpse of how the wealthy live surrounded by designer boutiques and upscale restaurants that cater to their every desire. If you have had enough of the beach you can cool off in the air-conditioned La Cañada Shopping Mall where you will find over 150 boutiques selling the latest fashions and accessories. The Mall also has tons of activities to keep the kids busy, a movie complex and restaurants that serve more than your typical Spanish fare of tapas and paella. With its fantastic rain and wind free weather, Marbella is a golfers dream, laden with palm trees, water hazards and greens that are as smooth as silk. Per head of population, Marbella has the largest number of golf courses than anywhere else on the planet making the city a top golfing destination. If you fancy a day trip from Marbella you have plenty of options available with Granada, Ronda and Seville all a short drive away. For the more adventurous holidaymaker, how about taking a day trip to North Africa? High-speed ferries can whisk you from Tarifa to Tangiers in just 45 minutes.